Why is one man’s word taken seriously while one woman’s is ignored? Do we really even need to ask? Well, that didn’t take long, did it? It’s 22 months until the next presidential election, and already one potential Democratic female candidate is being trashed while one Republican male who’s not even a candidate is being treated like an elder statesman who might challenge Donald Trump. On the last day of 2018, Massachusetts Sen. Elizabeth Warren announced the formation of a presidential exploratory committee—the first step in announcing an actual run—with a video that lasted four and a half minutes and gave details of what drove her to run for public office, focusing on her work to regulate big banks and to help consumers. Her website invites people to join the team. Within a day, the specifics of her announcement were being ignored, and she was being criticized for being unlikable and inauthentic. Never mind the fact that she beat her opponent by nearly 25 points in the recent midterm election. 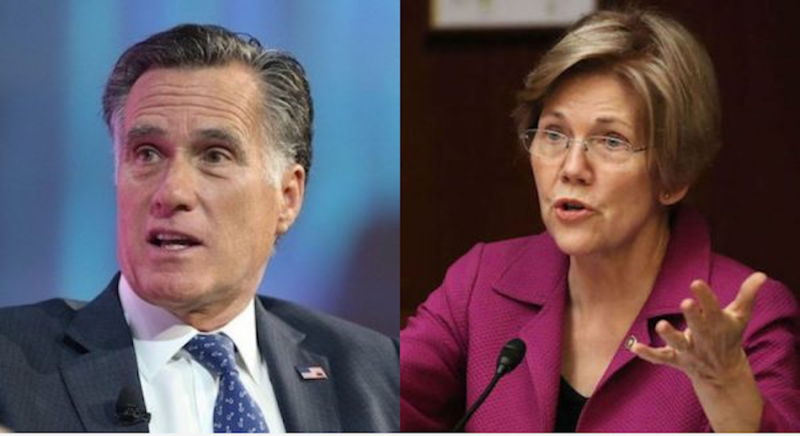 There were immediate stories on how Romney could win in 2020 and how there were calls from Republican donors to Romney advisers, with those donors all but chanting, “Run, Mitt, Run.” Never mind the fact that Romney lost the nomination to John McCain in 2008 and lost the race in 2012 when he was the nominee—he’s the anti-Trump flavor of the week. But Trump allies were quick to counterattack, some even suggesting a change in Republican party rules so that it would be harder for a challenger to fight Trump for the GOP nomination. It all turned out to be much ado about nothing: Romney says he won’t challenge Trump in 2020. So we have an actual candidate with actual ideas facing ridicule and a non-candidate being treated like a GOP messiah. The saddest part about all of this is that it’s nothing new. Men are taken seriously in high office, while women must fight for legitimacy every step of the way. We saw it in 2016, and now we’re seeing it in the 2020 race. A story in Politico with the headline, Warren battles the ghosts of Hillary, starts with several paragraphs telling the reader what’s wrong with Elizabeth Warren. It takes a few minutes of reading—likely when many would have stopped reading, not to mention those who only saw the headline on social media—to talk about any of Warren’s positive traits. It’s pretty shallow journalism to say that Warren is already “written off as too unlikable.” You wanna talk about unlikable? Try Sen. Ted Cruz, whom everyone reportedly hates but who beat the “likable” Beto O’Rourke in Texas. Twitter was not kind to the Politico article. I feel compelled to point out that Pulitzer Prize-winning journalist Connie Schultz is married to Democratic Ohio Sen. Sherrod Brown, who also might throw his hat in the ring. But her tweet has absolutely nothing to do with whether or not her husband has presidential aspirations; it simply points out the double standard. Farther down in the Politico piece was a comment by (finally!) a female Democratic operative. When Mitt Romney—who lost the popular vote and the Electoral College to Barack Obama—criticized Trump, he was talked about breathlessly as a potential 2020 rival. When Hillary Clinton—who received nearly 3 million more votes than Trump—dared to speak her mind, she was advised to take up knitting, a suggestion that (to be fair) received widespread condemnation. Even worse than the Politico article was a snarky piece in The Boston Herald quoting several “politicos” (all male, by the way) opining that Warren’s New Year’s Eve Instagram Live post of her and her husband having a beer was “inauthentic pandering” in an attempt to attract young supporters. What, so now there’s an upper age limit for drinking beer? You would think that after midterm elections that saw a record number of women running and another record number being elected to national office (not to mention being victorious in state and local races), at least some in the media would be over this kind of sexism. After all, more than 42,000 women sought help from Emily’s List in getting started with campaigns, compared with 920 in 2016, and the new group She Should Run helped 14,000 women candidates. But then, not all of us have the mindset of the Beltway media, some of whom seem to have blinders that filter out anyone not white and male. Hillary hatred, decades in the making, apparently is being transferred to any candidate with two X chromosomes. It has also led some Democrats to openly wonder whether the party would be smarter to avoid a female presidential candidate in 2020 — a notion offensive to many in the party. All of this doesn’t even address the ageism question: Trump is 72 and Romney is 71. Bernie Sanders is 77 and Joe Biden is 76. Compared with that lot, Warren is relatively youthful at 69. Yet her age is always mentioned, as was Hillary Clinton’s age in the 2016 race (she’s now 71). This is not meant to be an endorsement or a criticism of Elizabeth Warren. At this point, I don’t have a favorite of the likely batch of Democratic hopefuls—it’s way too early for that (for me at least). I like and am impressed by several and dislike a few of the Democrats who are said to be considering running for the nomination. The number of names being tossed around could be as high as 30 people (if you believe The New York Times). Democratic National Committee Chair Tom Perez already has announced a plan for scheduling 12 debates among contenders. But when the national media are unfair and sexist to women politicians and candidates, even at the very beginning of a campaign, we need to let those reporters and pundits know in no uncertain terms that they’re blowing their jobs of covering politics. The time for a double standard is long over. When will the media realize that? Originally posted on Daily Kos on Jan. 6, 2019.